The undercover plant area at Trevena Cross has been transformed over the past week, into what can only be described as cactus-world! 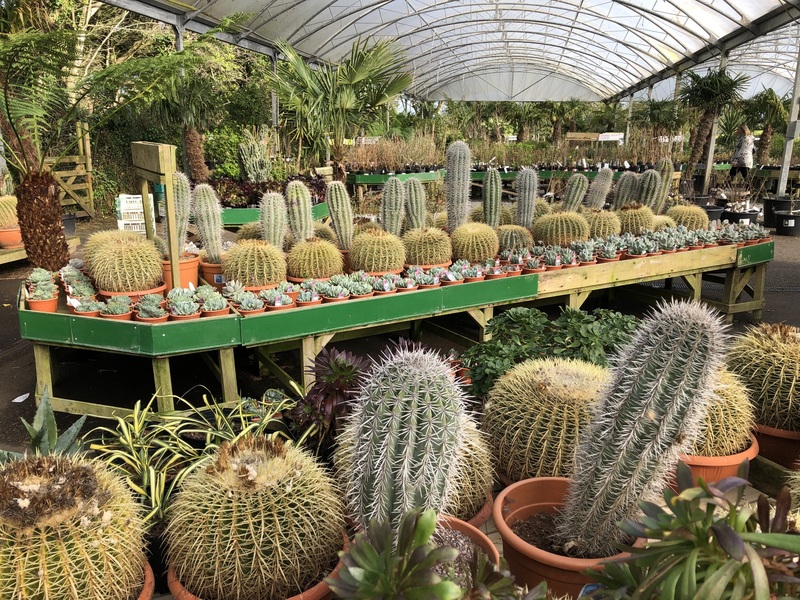 A huge shipment of Cacti and Yuccas from Spain have found home on site alongside the 90% of other plants actually grown at the nursery from seed or small plug plant. A fascinating group of plants most commonly associated with desert dry, arid terrain, they have long been popular houseplants and often firm favourites with children, being simple to grow and unusual looking. Their presence in a cold conservatory or outside in the garden, in full sunshine, has been less prominent however, and it seems we may all be missing a beautiful trick! Grown in pots, most cacti can enjoy a hot, sunny summer outside on the patio, as long as they are brought back in and protected from the frost and rain during the winter – even under a covered car port would be suitable! “To replicate a desert environment in our climes, and keep the plants thriving through hot and cold temperature extremes, the drainage has to be spot on. It is moisture that can reduce the hardiness of these plants if it hangs around in the soil. Improve heavier soils with organic matter to help break them down, and mix through plenty of mixed sized particle grit to improve drainage further still. Another great tip is to leave the top 2.5cm of compost in the pot, proud of the ground when planting, to keep the crown of the plant dry after it has been mulched with a layer of gravel (something that should be applied around the base of the plants after planting)”. The only other thing that might come in handy when handling these beauties is a thick pair of gardening gloves, or even better, woodburner gloves (for arm coverage)! Avoid watering through the winter, from around October onwards. Pop by – they’re quite a sight so definitely worth a look, even if you don’t have a home for one in your own home!